I am having difficulty repairing a Time Machine backup. 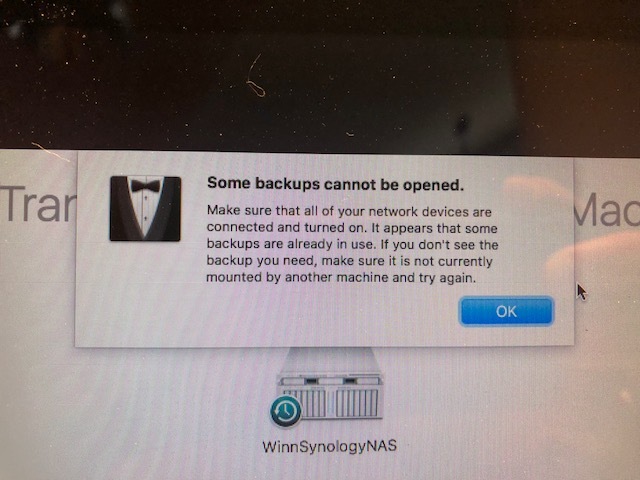 After upgrading from Sierra to High Sierra, the Mac had difficulty finishing Time Machine backups to the Synology NAS. Ultimately the Mac itself would not reboot and the hard drive was wiped with Sierra reinstalled at the Genius Bar. (I was confident I had backups via the NAS). 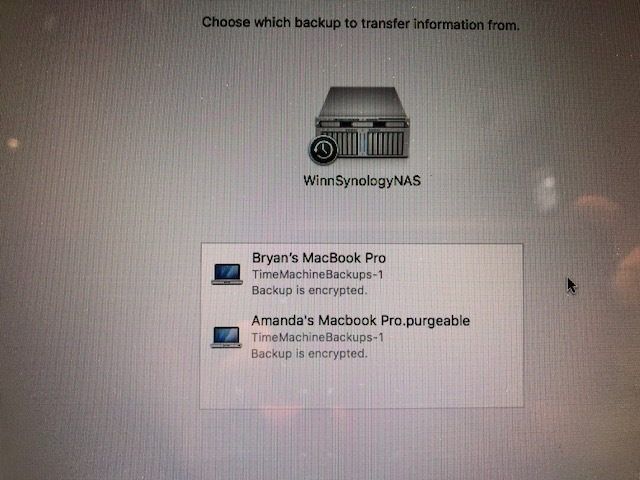 When I tried Migration Assistant I notice that the backup is "Amanda's Macbook Pro.purgeable". The backup is encrypted (as I had set up.) I enter the encryption code and get the error "Some backups cannot be opened." Then I notice that it says there are "no volumes found in backup". I then leave migration assistant and go into the backup folder on the NAS. 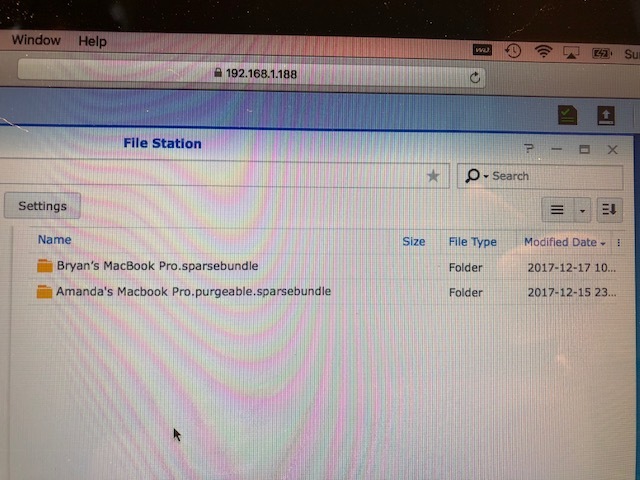 I find the folder "Amanda's Macbook Pro.purgeable.sparsebundle". In it there are a number of files and a very large "bands" folder. The whole backup folder is 800+ GB which is about right for my MacBook Pro, so I know the information must be in there. I make a copy of the entire backup folder to a separate drive so that I have a backup of the backup that is untouched. I tried using the Terminal commands that many have outlined and had success with. I run into trouble halfway through this process. after sudo su - I perform chflags -R nouchg on the sparsebundle folder which takes a little time and then completes. I run the fsck_hfs -drfy /dev/disk1 and even fsck_hfs -p /dev/disk1 and I get a very fast process (less than a second, rather than the several minutes to hours) and no mention of a volume being repaired or not repaired. I unmount and try to use the backup but still cannot and it doesn't look like the folder was changed at all. I tried DiskWarrior on this as well (to a copy of the copy that I made to a second external HD) and still having issues. Does anyone have any advice? I would appreciate any help! All of my children's photos are on this from the past 2 years and I would hate to lose them all. Since Apple does support network file shares for time machine. I’d push the Synology support harder. 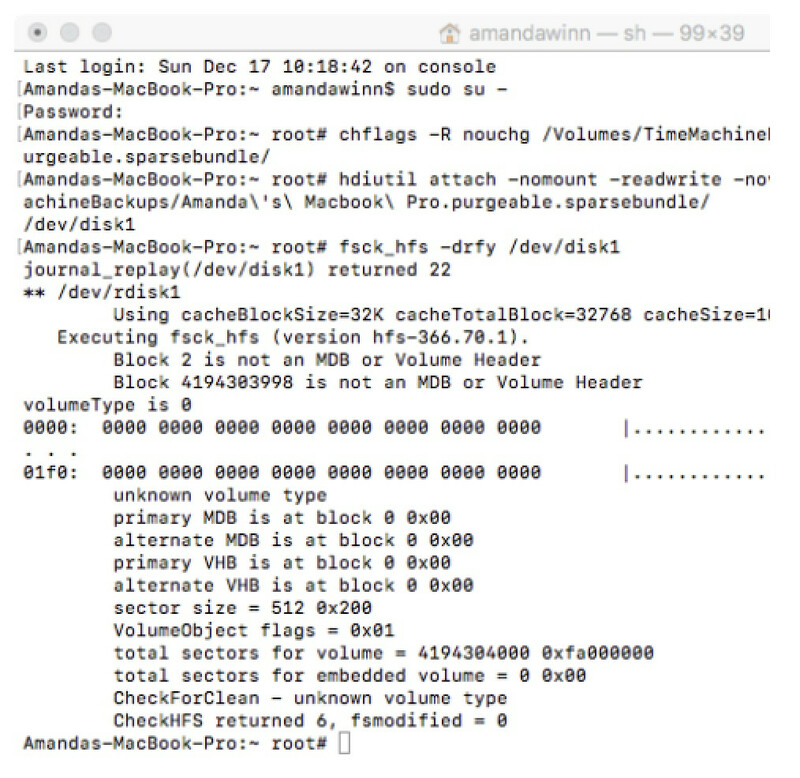 You could also find someone to assist given how detailed your notes are - someone that does t ch work might be able to sit with you for an hour or so and collaborate and see if your backups are viable for a restore. Not the answer you're looking for? Browse other questions tagged terminal backup time-machine high-sierra nas . How do I repair a corrupt Time Machine sparsebundle that is only showing the most recent backup? 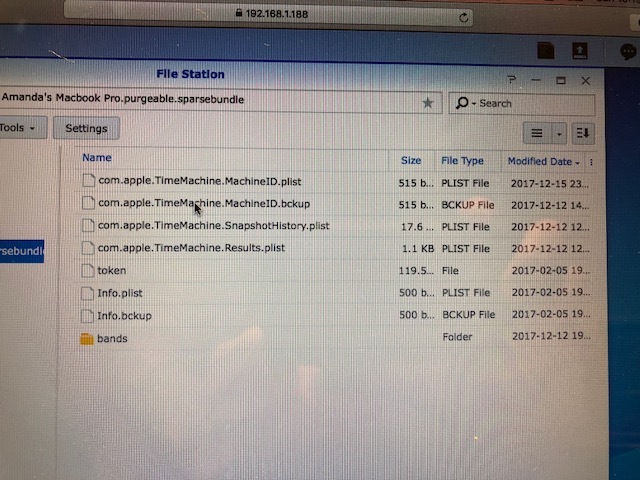 Why is Time Machine backing up to .sparsebundle file? How to inherit sparsebundle on macOS Server Time Machine service?